Marthe Louise Vogt was born on September 8, 1903 in Berlin, Germany. Her parents, Cecile and Oskar, Vogt were leading neuroanatomists and an interest in neural research started early with Vogt. She earned a medical doctorate and a PhD in chemistry from the University of Berlin. Vogt worked as an assistant to Otto Trendelenburg at the Berlin University pharmacology department starting in 1930. A year later she was appointed as head of the chemistry department of the Kaiser Wilhelm Institute. In 1933, with the election on Hitler, Vogt decided to emigrate to the United Kingdom. Although she was not Jewish, with the rise of Hitler she felt she must leave Germany. In 1935 she got a Rockefeller Travelling Fellowship at the National Institute for Medical Research in the laboratory of Sir Henry Dale. While working there she published with Dale and Wilhelm Feldberg a seminal paper in neuroscience describing how acetylcholine serves as neurotransmitter in the voluntary nervous system. Nerve impulses are sent electrically down nerves by changing the permeability of the cell membrane to sodium ions allowing them to rush in. Once the impulse reaches the end it releases acetylcholine into nervous/muscle junction. The actylcholine serves as a chemical messenger quickly diffusing across the interface and causing the muscle to contract. The next year she moved to Girton College, Cambridge, where she remained for four years. When World War II broke out she was scheduled to imprisoned as an enemy national but her colleagues came to her rescue, Dale phoning the Home Office demanding an interview with the Home Secretary. 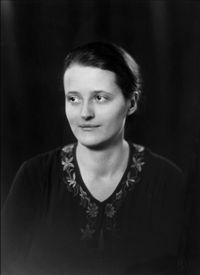 During the war she worked with John Gaddum at the College of the Pharmacological Society in London and in 1948 published another paper with Feldberg demonstrating the presence of acetylcholine using nerves in the brain. Vogt followed Gaddum to the University of Edinburgh, where she was first hired as a lecturer and then as a reader. In 1952 she was elected to the Royal Society of London, a honor that had only been given to 8 women before her. Vogt's research now centered on amines and their use as a neurotransmitter. Later in her career her work centered on serotonin and its effects in the brain. This research lead to breakthroughs in pharmaceuticals that aids patients with depression. Honors won by Vogt include a Roylal Medal from the Royal Society in 1981, honorary doctorates from the University of Edinburgh and Cambridge University and honorary membership in the American Academy of Arts and Sciences. She retired due to ill health at the age of 87 and moved to La Jolla, California to live with her sister. She died on the day after 100th birthday, September 9, 2003.